I’m a life-long bread baker, having grown up in Berkeley in the 1970s with a homemaker (grow it/can it/dye it/weave it/build it) type of mom. One year she grew some wheat in the back yard, threshed it, ground it, and made bread. I thought that was pretty cool; she thought it was far too much work and never did it again. Fast forward to 2010, when Jim and I moved to our little homestead. Suddenly we had enough space to conceivably grow all the wheat we needed. I estimated that 1/4 acre would cover our bread, pasta, pastry, cake, and cookie needs. But what kind(s) to grow? There were so many considerations: we needed something that would grow well under organic cultivation in our region, be a good fit in rotations with other crops, be easy to harvest and process, have good baking qualities, be nutrient-dense, and be pretty; a lot to ask. The search was on. I like to bake with 100% whole grains, both because we like to get the full nutritional value of the grain and because we don’t have the capability at home to make white flour as it is done commercially. However, I’m not fond of the dense, brick-hard, quick-to-stale bread that 100% whole wheat sometimes is known for. Baking high-hydration sourdough bread (usually 85-95% hydration, slow fermentation, and shaping methods similar to this) helps in getting a nice fluffy loaf, although it can still be denser than I’d prefer. The wheat variety can have a large impact on the fluffiness of the bread, and one variety that produces fluffy loaves almost effortlessly is Blanca Grande, which is a modern wheat that Coke Farm – a producer in our area – has been growing. Blanca Grande loaves are so easy to make that I got in a kind of a rut, baking with it almost exclusively for a few years. However, we weren’t sure that this was the variety we wanted to grow. As a modern variety, it has been bred for high yield, high gluten content, disease resistance, and short stature, but may have some drawbacks as well. Modern wheat varieties may have less extensive root systems than older varieties*, and so may not be as drought tolerant as older ones. The short stature, although valuable in reducing the tendency to lodge, may not be an ideal fit with organic production because it can leave the plants vulnerable to competition from weeds. The taller (generally older) varieties are thought to be better able to out-compete weeds, in part by shading them out. The improvement in disease resistance that comes with some of the newer varieties is quite attractive, however; it’s a bummer to lose your whole crop to rust. * although the particulars about this are not clear – see for example, this and this – and there is evidence that this is changing in recent wheat breeding efforts. On the eating side of things, high gluten content is appealing, but not if it comes at the expense of other properties. The limited root systems of modern wheat cultivars may leave them less capable of scavenging soil nutrients. In fact, some research suggests that older wheat varieties contain higher mineral concentrations than do newer ones, although this seems to be limited to the soft wheats. This may not be important in commercial applications, since the majority of wheat is used as white flour, with the nutritious germ and bran removed and then nutrients added back to make up for the loss (from the removal and/or from breeding). However, nutrient density is important in cases such as ours, in which we’re trying to get our nutrients from our actual food. 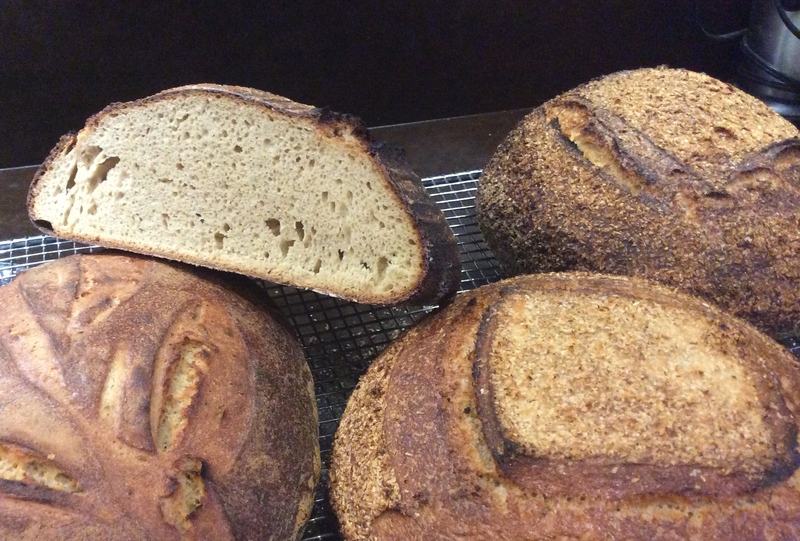 We are also looking for flavor in our food, and modern wheat varieties have not, as a general rule, been bred for flavor, nor with a focus on use in whole wheat sourdough baking. Another drawback of modern varieties is that many of them have some level of restriction on seed use. Some are patented, and it is not legal to save and replant their seed. Others have PVP (Plant Variety Protection) status, which puts restrictions on selling or sharing the seed with other growers for a period of time (generally 20 years) after initial release. I don’t fault companies for protecting their investments in this manner, but since part of what we want to do is find varieties suitable to the local climate and share them with other local growers, the need to continually go back to the seed company for planting stock doesn’t really suit our goals. It would also be complicated to work within these restrictions if we end up trying to breed our own locally-suited varieties, as well; we would ideally start with unrestricted varieties so that there would be no question about ownership. So we started looking around for options. 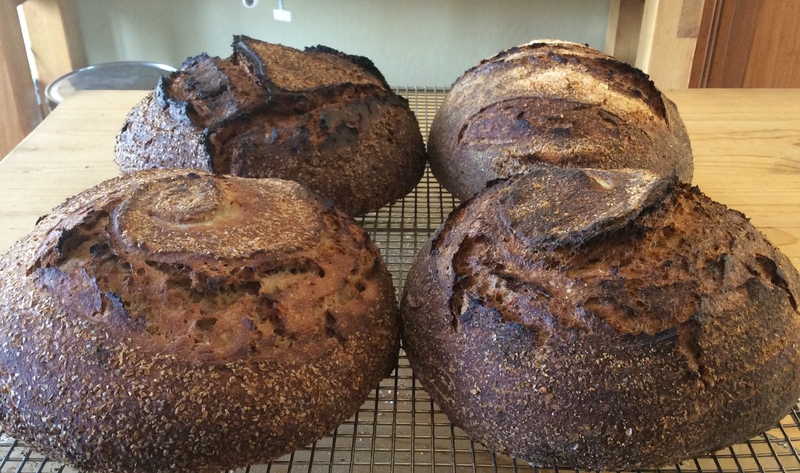 We started by test baking varieties grown by other producers in our region, namely Coke Farm and the UCSC Farm, and by growing a few varieties recommended by Monica Spiller, of Whole Grain Connection. 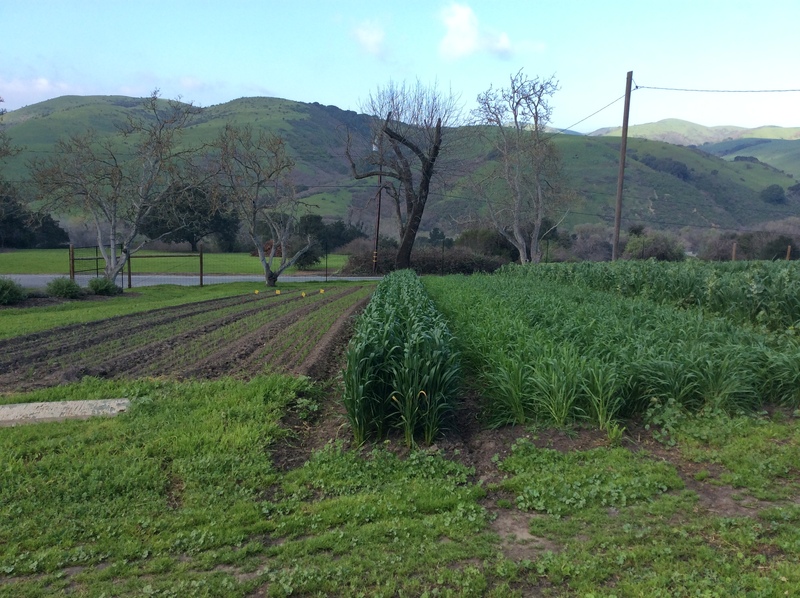 We also started growing and testing other grains such as millet, buckwheat, spelt, barley, oats, and amaranth. (Several of these – namely millet, buckwheat, spelt, and some oats – have hulls, and so we are putting them on the back burner as we figure out a way to efficiently dehull them; I’ll talk about that in a future post. Meanwhile, we continue to grow them for chicken feed). We are also keeping track of things like planting date and rainfall levels, to get a better handle on what makes the best wheat in our area. 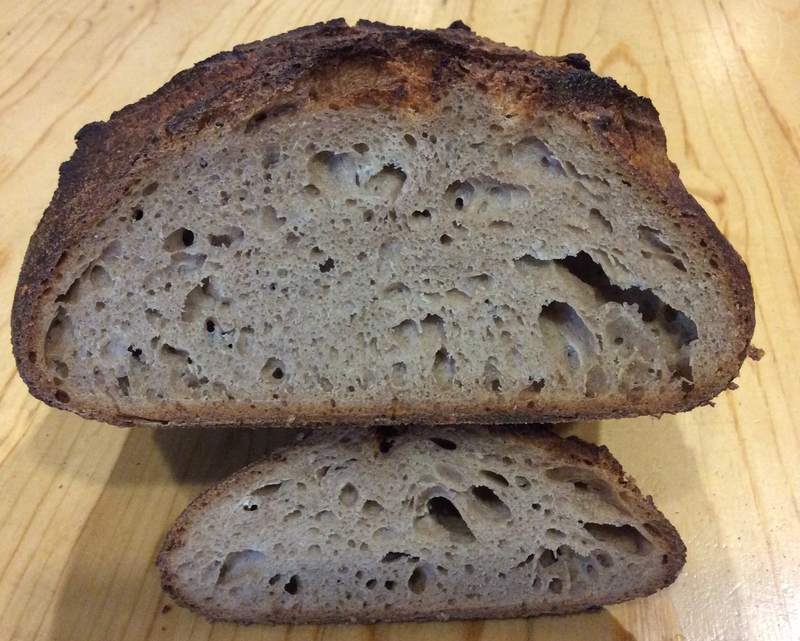 100% Sonora wheat, grown by School Rd Farm, 2014 crop. Sonora is an old variety of soft white wheat, and was one of the most common varieties grown in Mexico and California for hundreds of years, popular because of drought tolerance, disease resistance, and good baking qualities for things like tortillas. After WWII its popularity declined, following the development of semi-dwarf varieties. Read about the history of Sonora wheat here and here. Although much more challenging to work with than something like Blanca Grande, it makes a wonderful loaf of bread, with sweet hints of corn flavor. 100% Red Fife, UCSC 2014. Red Fife was at one point the most common wheat grown in Canada and across the Great Plains. It is, like Sonora, rather challenging to work with, but has a depth of flavor that makes it all worth while. It is highly susceptible to rust, and we are currently experimenting with planting dates and selections to try to overcome this issue. 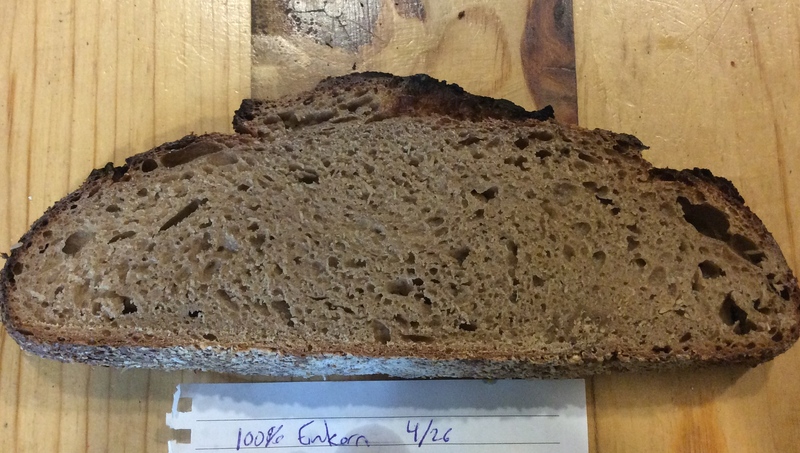 100% Marquis wheat, UCSC 2014. Marquis was developed from Red Fife, and is much less touchy and also delicious. We hope to plant some test plots of this in the coming growing seasons. 100% India Jammu, Coke Farm, 2014 crop. India Jammu is a landrace wheat collected in 1923 from India. 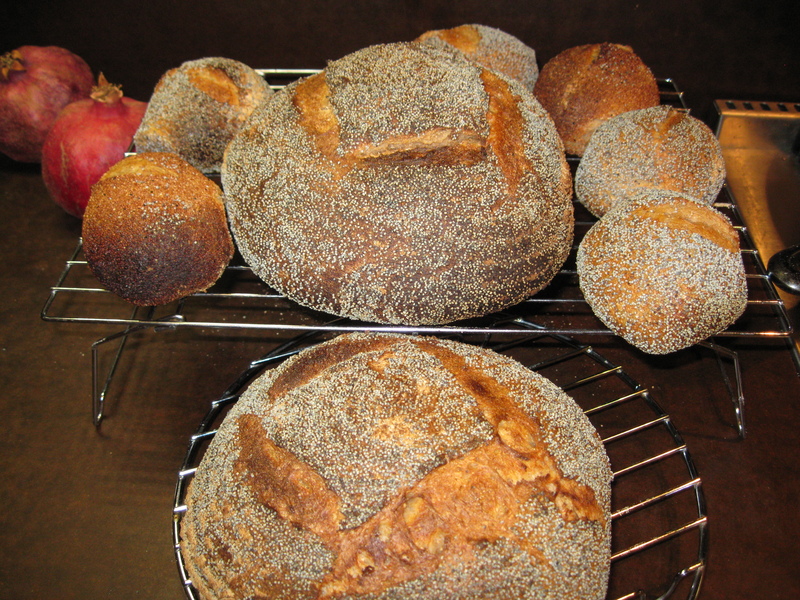 It is quite forgiving in bread making – the loaves pictured above were made from wheat that was just over 8% protein, which is extremely low for a bread wheat, yet they demonstrated great gluten development and a fantastic flavor. We are beginning to test its suitability in our production system. I’ve had variable luck with spelt: sometimes I can get it to turn out all fluffy like this loaf, sometimes it is flat as a pancake. Nutty, mild flavor; makes fantastic toast. The big drawback, as I mentioned above, is that it is hulled, so if we were to grow it we would need to invest in a dehuller. 100% Einkorn on left, 50:50 with Blanca Grande on right. 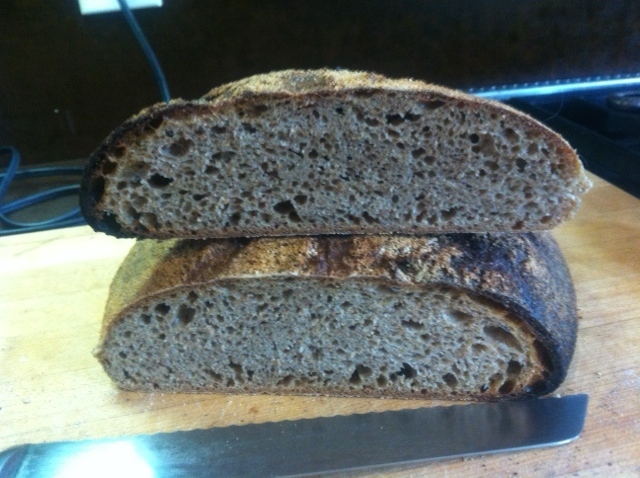 Crumb of 100% Einkorn bread. 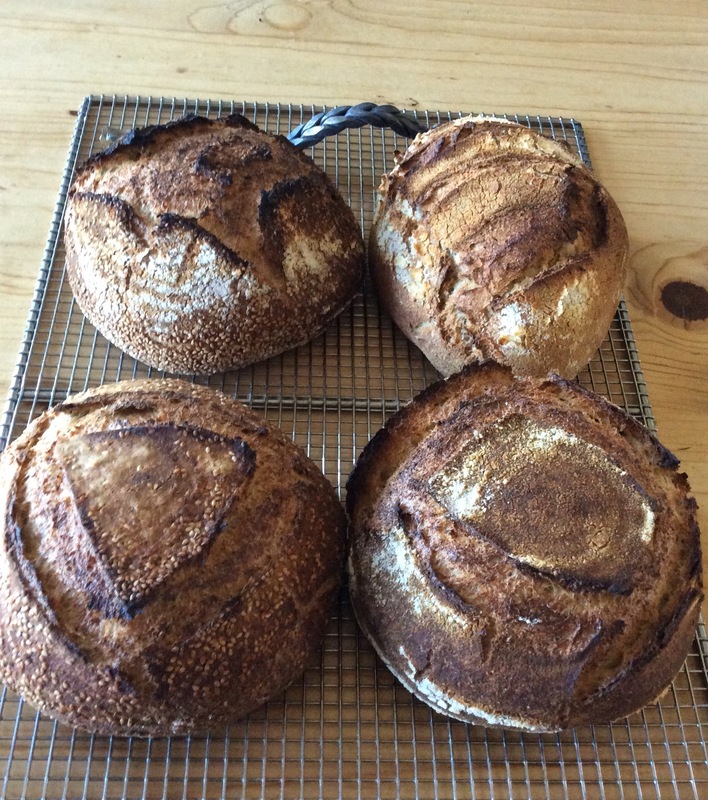 I have just started to experiment with Einkorn, and am really enjoying it. Of all the older types of wheat and wheat relatives, its flavor is the most distinct from modern wheat, and it even smells markedly different while cooking. Einkorn is a diploid species, and was one of the first wheat types to be domesticated. It is high in protein, but low in gluten, although that doesn’t seem to prevent it from making a very springy loaf of bread. It is said to produce well in drought conditions, so we are considering growing some test plots of it in the future. The only drawback is that it has a hull… we really need a dehuller! 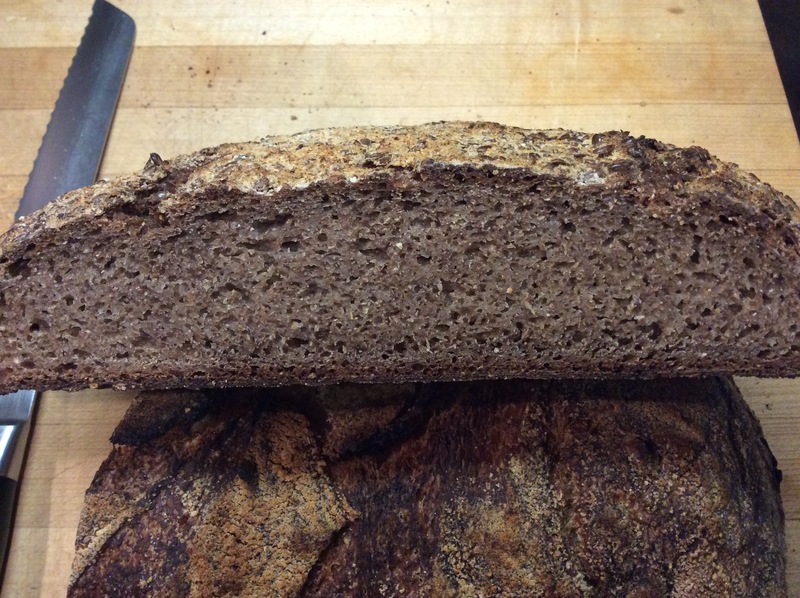 The only type of emmer wheat I have tried is Ethiopian Blue Tinge, and while the flavor is fantastic, I just can’t get it to puff up into a nicely-shaped loaf. 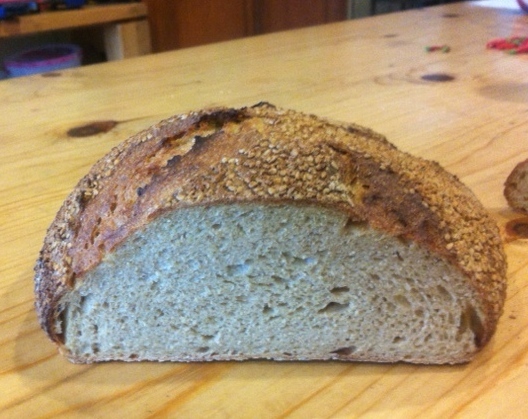 Emmer is botanically similar to einkorn (diploid, hulled, ancient), but does not seem to have the same baking qualities. This is not high on our list for further exploration. Khorasan, left, and mixed 50:50 with Blanca Grande, right. Khorasan seems to me to be similar to spelt in how it handles during baking. It makes a very stretchy, pliable dough, and rises nicely during baking. The taste is also similar to spelt: nutty, smooth, a bit minerally. We will be testing this out in the coming years, as well. Khorasan is not hulled, so production on a homestead scale will be less challenging than with spelt, einkorn, or emmer. 2014/2015 wheat trials, School Road Farm. For the 2014/2015 production season we are testing several types of wheat for performance on our farm, including Sonora, Red Fife, Blanca Grande, India Jammu, and Khorasan, as well as the durum wheats Bolero, Cristallo, Desert King, and Senatore Cappelli. Next year we will replant the ones we like the best, and will also include some other types that we didn’t manage to plant this year, including Marquis, spelt, einkorn, and some of the varieties tested in a trial last year a bit north of us, including Turkey Red and Lassik. 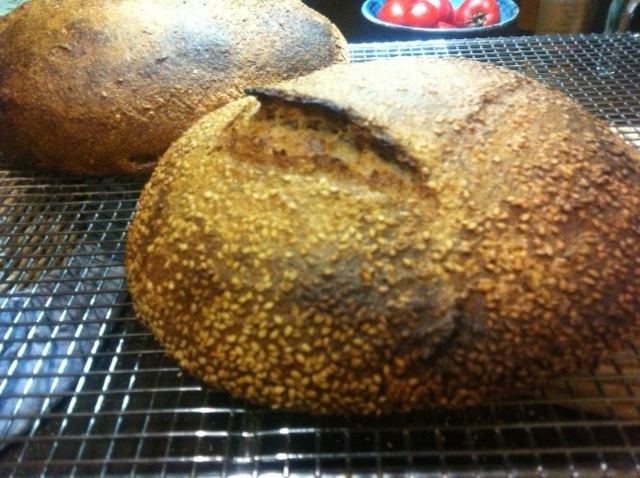 This entry was posted in ancient grains, grain production, slow food, wheat and tagged bread, sourdough. Bookmark the permalink.